Eunice Christabel D’sa, rubella née Pinto was born 103 years ago today. I called her Mummy. She was my grandmother but a two-year old doesn’t distinguish; the woman who raises you is your mother. I slept by her side everyday on a narrow cot till a month after my ninth birthday. As we fell asleep, I’d poke the wobbly mole on her belly, follow the soft maze of lines on the backs of her elbows or play with her spare, thin gold bangles. I don’t recall a single instance of her raising her voice at me. When I’d tell her this, she’d say “That’s not true. There was this one time. You were small and you spit out your food. I thought you were being rude. I had a comb in my hand and I gave you a light whack. It was the only time in my life. I looked down and saw there was a cardamom in your bite. Naturally you spit it out! I felt awful.” She walked me to nursery school, then to the bus stop at the rail road tracks when elementary school started. She made all my birthday cakes from scratch; it took several baking pans to get the requisite parts for a train, a house, an animal. She sewed my special occasion dresses from bits of silk saris on an old Singer with a pedal you moved with your foot. She curated my playdates with great attention, the more cosmopolitan the family the better. I had friends who were Spanish, English, Japanese, brahmin, bengali, muslim and Mizo. Her confidantes ranged from her peers to those a quarter of her age and stayed that way her whole life. She perfected the art of listening and asking minute follow up questions. She could keep a conversation focused on the other for a long time. She’d remember meeting a friend of mine once and 10 years later say, “how is that friend of yours, the Egyptian one, what a beauty she was.” The more well read, well traveled, and observant of life a woman was, the more Mummy enjoyed her company. 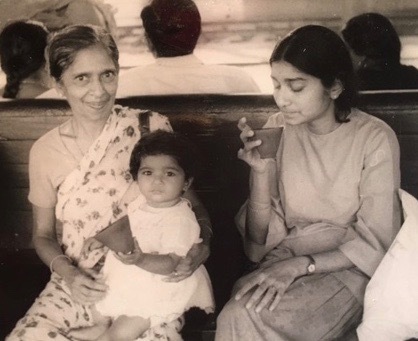 My love for my grandmother was visceral and total. Before my husband and son, to borrow a line from Cheryl Strayed about her mother, “she was the love of my life.” Her wit was her rod, her grace her lasting effect. 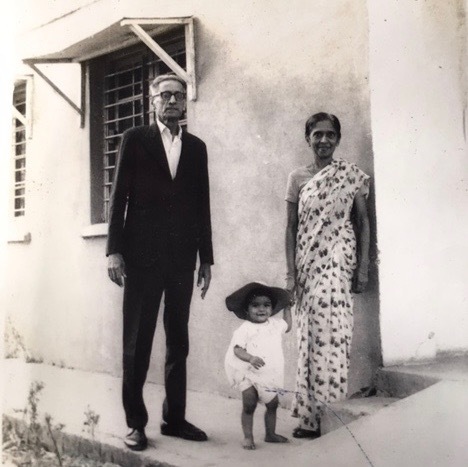 As I was getting ready to leave for America I said “these are your last few days to be nice to me.” She said “why not my last few days to be mean to you.” Years later my grandfather told me she'd told him if I moved to America it would kill her. I did and it didn’t; she thankfully lived a full and happy life for decades more. As I get older I think of how she managed her way through loss, how she held onto joy with a quiet ferocity. I wish I could still learn from her. I miss her listening sense and think of all the people and moments she’d find funny. My father described her once as a reed, slender, elegant, yielding flexibly to the elements, but unbreakable.